The organic farm "Wald am See" is located in Kitzbühel directly on the Schwarzsee (a designated nature reserve) and covers 17 ha, of which about 12 ha are grassland and 5 ha forest. The farm is nestled in the fields and the forest overlooking the lake. A side street leads to the courtyard and to the houses behind. 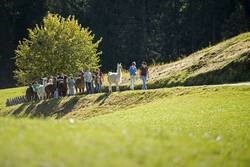 This Tyrolean organic farm is run as a branch office of a special education school. Since the school year 2014/15, the Federal Ministry of Education, Art and Culture has been carrying out the school experiment "Animal-Assisted Pedagogy" for the General Special School in St. Johann i. Tyrol approved. With the certification for the "Animal-Assisted Therapy, Pedagogy and Social Work on the Farm" (ÖKL) "Wald am See" is the first certified farm in Tyrol. The offers as a Green Care diversification project ranges from “Animal-assisted education” and competence development, school on the farm, workshops, project days, farm holidays ... to meet animals, experience with nature and agriculture, as well as educational and recreational purposes. After the successful project "Every Monday a farm day", since the school year 2014/15 the pupils of the general special school in St. Johann i. T. 2 school days a week at the farm "Wald am See" instead of at school. 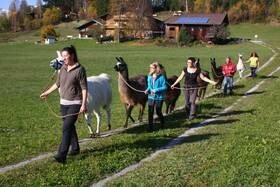 Following on from the "animal-assisted units" with llamas, donkeys, sheep, ponies, etc., and the resulting increased attention, increased concentration and improved perception, reading, writing, arithmetic and more are also being used in the newly adapted premises learned, practiced and consolidated. Exercises of daily life and everyday practical skills find space and time on these days. The habitat around the yard, the use of the trained and certified animals and the nature with its different cycles become the subject of the lesson and the classroom. “Animal-assisted education” refers to the targeted use of farm animals for educational, therapeutic or social purposes. The farm offers a holistic experience which, in addition to intensive animal contact, also includes basic agricultural activities and processes in educational / therapeutic processes.